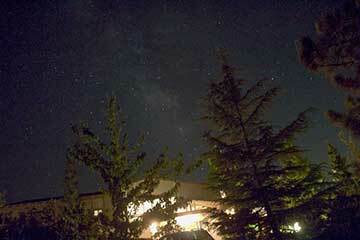 (for a fee) struggling amateurs and physicist wannabes like myself. Now, remember that when I attended the Energy Storage Conference in San Diego (see the post of October 7), I felt ok about listing my affiliation on the conference badge as "Palmia Observatory". Well, that maybe was fine there, but I just couldn't get up enough nerve to put that on my badge for this AAS conference. 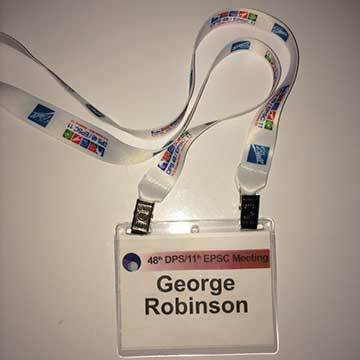 Yep, I just couldn't see it happening because, I mean, after all, the other folks attending this meeting are real astronomers with a real dome or maybe a real orbiting observatory and everything, and I thought it might be a little pretentious to put anything else on the badge. As it turns out though, our banquet dinner companions laughed, when we all exchanged business cards, and they all liked my Armchair Cosmology title on my card. I guess it would have been alright, after all, I do have telescopes and we do make observations and analysis and do share a love of astronomy. 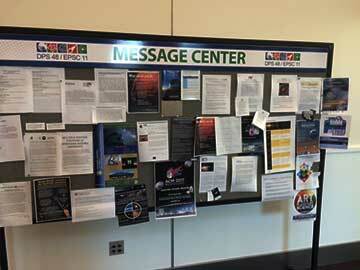 Hey, there was even a job board for those folks looking for a job in astronomical type studies and research. Nope, there was nothing there for me. 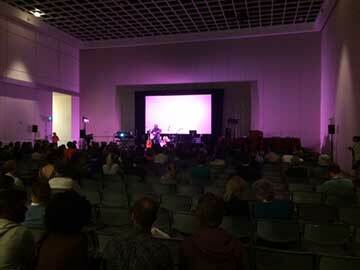 It was a lot of fun to pick and choose among the various available sessions. The AAS organizers run a very tightly scheduled event and each speaker has just 10 minutes to make their presentation and answer maybe a couple of questions. That way if you found that the session you sat down in was just not right for you, maybe you couldn't understand the topic, which happened sometimes, you could easily move to another session and find something more to your interests. Hey, even Math Whiz Dave was there too. That made the event a little more fun. He knew a lot of folks there and people always remembered him and his iconic hat. 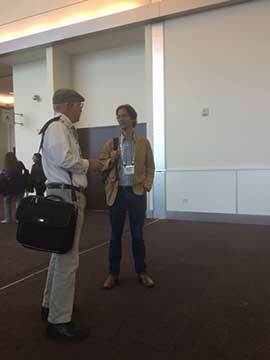 We had a chance to talk to a lot of different folks and since this meeting was a combined meeting with international scientists from the European Planetary Science Congress (EPSC) were also in attendance. It became immediately apparent how discoveries and investigations in astronomy are being conducted on an international basis. Even though the US and NASA take the lead, space science is just too expensive for one country alone. What is especially neat right now is how many of the entrepreneurial billionaires are interested in space and are funding their own missions of discovery. Separately we met many scientists, who were married to other scientists and their separate careers took them to different countries and forced separations. One scientist from Holland works in the US and other places and his wife from Portugal works and lives there. Another PhD postdoc from Ecuador works and lives in Colorado and is mostly forced to choose to live where the work is. In addition to the many presentations, the convention center exhibit hall was full of posters and vendors displaying their wares. Many vendors like NASA had beautiful displays and literature about current or upcoming missions and scientists on hand that were involved in various missions. 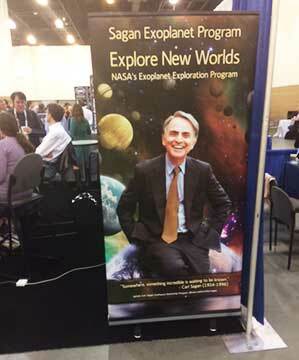 One poster I especially liked was one of Carl Sagan. He was such an inspiration to a lot of folks and I know that I personally, even though I kind of made fun of "billions and billions", even he wasn't completely in charge of that, he still inspired me to do more work in astronomy. Thank you Carl! I also looked over several of the book vendors that were in the exhibit hall and found this great book on Asteroids and Dwarf Planets and How to Observe them. 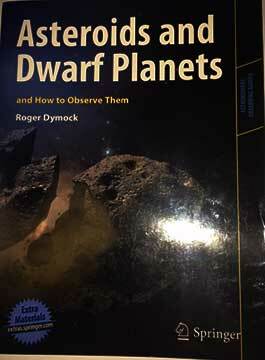 I wish I would have discovered this book earlier as it definitely provides some good practical types for capturing asteroids, etc. I also made a mistake and bought the revised 2nd edition of a planetary science textbook when I had already purchased a used copy of the original edition several years ago. Darn, I think I am out of control sometimes and my interest in a subject gets way ahead of my ability to actually read up about it in the first place. Math Whiz Dave suggested that I could donate the original copy to the OCA library, which sounds like a great idea. I'll have a few summary comments about some of the sessions that I found most interesting in the next post.